This is an example of a convolutional neural network (convnet) applied to an image classification task using the CIFAR-10 or CIFAR-100 dataset. The CIFAR datasets can be a good choice for initial experiments with convnets because the size and number of images is small enough to allow typical models to be trained in a reasonable amount of time. However, the classification task is still challenging because natural images are used. This is an example implementation of DCGAN (https://arxiv.org/abs/1511.06434) using trainer. This code uses Cifar-10 dataset by default. You can use your own dataset by specifying --dataset argument to the directory consisting of image files for training. The model assumes the resolution of an input image is 32x32. If you want to use another image resolution, you need to change the network architecture in net.py. This is a minimal example to write a feed-forward net. The code consists of three parts: dataset preparation, network and optimizer definition and learning loop. This is a common routine to write a learning process of networks with dataset that is small enough to fit into memory. This is an example implementation of Show and Tell: A Neural Image Caption Generator (https://arxiv.org/abs/1411.4555) a generative image captioning model using a neural network with convolutional and recurrent layers. Given an image, this model generates a sentence that describes it. ・Each line contains one training example. ・Each line consists of two elements separated by space(s). ・The first element is a path to 256x256 RGB image. ・The second element is its ground truth label from 0 to 999. This is an example of end-to-end memory networks. This is an example of evaluating a Caffe reference model using ILSVRC2012 classification dataset. It requires the validation dataset in the same format as that for the imagenet example. Model files can be downloaded by download_model.py. AlexNet and reference CaffeNet requires a mean file, which can be downloaded by download_mean_file.py. This is an example of a POS-tagging problem for natural language processing. Part of speech (POS) is a category of word, such as noun and verb. POS-tagging problem is the task of assigning part of speech to each word in a sentence. This problem can be formulated as a sequential labeling problem. So, you can apply this example to another problems such as named entity recognition. This example uses traditional linear-chain CRF model. And of course you can extends this model with RNN, LSTM, Bi-LSTM and CNN. This is an example of a recurrent net for language modeling. The network is trained to predict the word given the preceding word sequence. These are minimal examples of writing reinforcement learning agents. You need to install gym before running the examples. ・dqn_cartpole.py implements DQN and DoubleDQN and supports discrete-action tasks. ・ddpg_pendulum.py implements DDPG and supports continuous-action tasks. This example implements the simple recursive model by Richard Socher. It requires the preprocessed dataset which is available by running download.py. This is a minimal example of sequence-to-sequence learning. Sequence-to-sequence is a learning model that converts an input sequence into an output sequence. You can regard many tasks in the natural language processing field as this type of task, such as machine translation, dialogue and summarization. This example intends to show how to use serializers with minimal code. 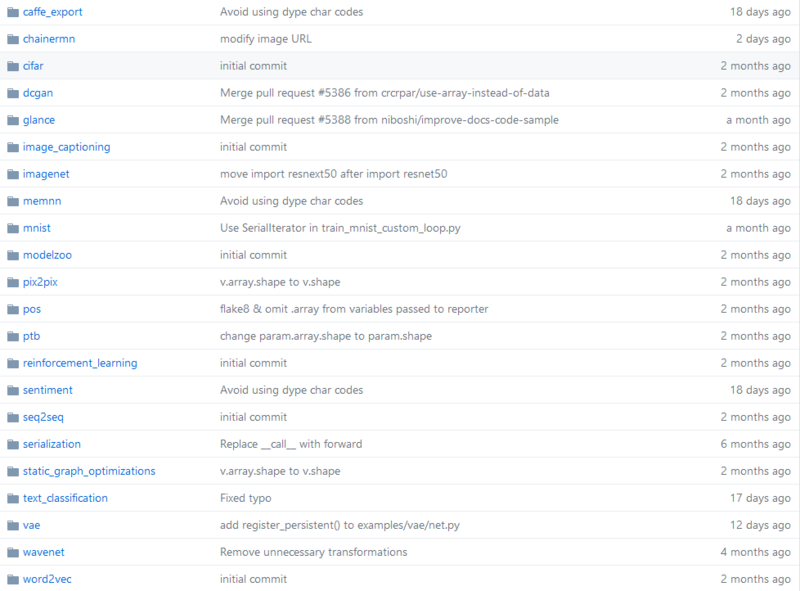 These scripts show two ways to save/load snapshots using NumPy and H5Py, so please ensure that you have installed h5py package besides NumPy preliminary. The subfolders in this directory contain versions of the following Chainer examples that were modified to support this feature. Since the static graph optimizations feature is experimental, these examples might be unstable. This is a sample implementation of variational autoencoder. This method is proposed by Kingma and Welling, Auto-Encoding Variational Bayes, 2014. A Chainer implementation of mel-spectrogram vocoder using WaveNet. This is an example of word embedding. We implemented Mikolov's Skip-gram model and Continuous-BoW model with Hierarchical softmax and Negative sampling.